For some time a Corbin Sparrow has been lying in a poorly state on my drive following a electrical failure that pushed her original owner in to deciding it was time to give her up. An investigation found a few faults including dead batteries (one in particular that looked to be the main culprit with a large burn hole in the top), motor brush gear stiff and mucky, a few wiring faults and the usual stiff brakes. The car was also given a good clean and tidy as she was looking a little sad. She was then taken to the local garage MOT (Ministry of Transport) testing station where she flew through her MOT with no advisories (although whilst there she did cover a few additional miles from the curious mechanics who all came back beaming. She is looking good and is ready again to hit the road however as always there is a hitch. I just can’t warrant another EV on the drive, or as my good lady says too many toys! If you are interested in acquiring a very rare bird, Number 10 off of the production line, then drop me a line. Time is unfortunately short but its a chance to get your hands on a rare and great vehicle. 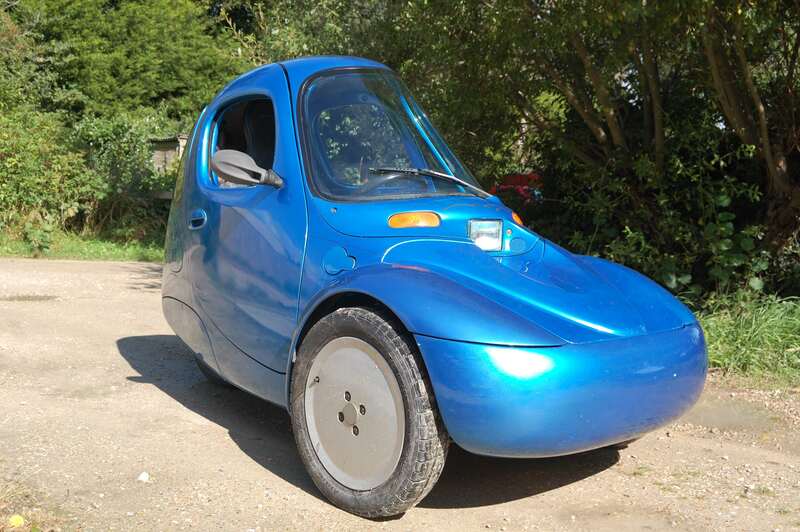 What do I want, ok £3.5k will buy you this rounded electric vehicle. She’s done around 10500 miles and she comes with a box of mechanical bits. If your an EV boffin you’ll know that her components would cover the cost although it would be sad to see her broken for them as she is far too much fun to drive. Q.Can you tell me the range and speed of the sparrow? A. The Sparrow will do 70 mph and probably a bit more should you be feeling brave. Range is dependant on how much you want to hit the battery pack. The life of the battery is dependant on the depth of discharge and is inversely proportional. An example would be 20% DOD 1000+ cycles, 90% DOD 200 cycles. The original owner used the car every day but was typically only doing around 15 miles, in to town and back, and as such her battery pack lasted well. She did however learn the hard was by killing her 1st pack where she pushed the car regularly around 30 miles and whilst it would do it, it was looking tired after a year. The range answer is you’ll get 25 miles if you drive steady without hammering the pack. I would however be looking to keep the journeys under 20 miles with the use of opportunity charging. Carrying the charge lead and an extension can increase your pack life considerably. The car uses around 150 Wh/M so 10 miles is 1.5 KWh (1.5 electrical units). The charger is a 3kW unit so could replace the bulk of this in an hour, although a proper and managed full charge will take longer. So if your popping out to see a mate for a coffee plug in when you get there, paying for a couple of units will be preferable to buying a new battery pack early! I used a Sparrow daily for my work commute when I was near Plymouth and was doing 40 miles a day. The commute was possible because my employer was happy for me to plug in at the office and charge whilst I worked, costing him around 10p per day! The run was on the busy A38 and the car had no trouble running at regular traffic speeds. The controller is currently tuned down to stop temptation for fast runs but if your commute was short, less than 10 miles, it would be easy to turn it back up for a quick run.